0:01Skip to 0 minutes and 1 secondWhat is STEM? Can you tell me? 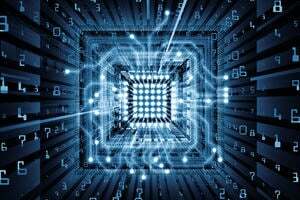 Science, technology, engineering, and math. There you go! The leaders of the STEM Action Centre brought a fantastic idea to us. And that was to create a mobile platform to take STEM to kids throughout the state of Utah, urban and rural. Lift it up. The Utah STEM Bus travels throughout the state of Utah to schools and other organisations to provide these hands on real world project based learning opportunities that help generate passion for STEM careers. To us at MHTN Architects, the STEM Bus is very important, because we work with a lot of districts across the state, but sometimes there's a lack of either funding or resources. 0:48Skip to 0 minutes and 48 secondsAnd so the STEM Bus and Utah STEM Action Centre really become an opportunity to get that out into those communities, to help those under-served areas. That's a good idea. Oh, we have to test it, though. Yeah, I think we do. And to really develop and foster those key curiosities that are naturally there, and maybe need to be pushed and prodded, and hopefully those explode into something beautiful. Tesoro has a very large footprint in the state of Utah. We envision the Utah STEM bus as a resource that will benefit the communities where our employees work, whether they're along the Wasatch front or in rural Utah. So think about what you can do to maybe improve upon your design. 1:30Skip to 1 minute and 30 secondsIt's not connected to the wire, I bet. It was so great to have the Utah STEM Bus come out. My class learned about robotics, and it was such a good opportunity for them to have such a hands on experience that I don't have the resources to give them every day throughout the year as often as I'd like. It's green. Oh, I think that's just programming it. And it also engages students in the Governor's Initiative to be a STEM competitive work force in the state of Utah. Forbes just ranked Utah the number one state to do business in. 2:01Skip to 2 minutes and 1 secondIt is important within the next decade with all of these jobs coming to our market, all of these startups forming in our market, that our children will have the skills necessary to work in these fields. OK, there it is. Hands on learning experiences in STEM is really what creates the STEM atmosphere and gives them the opportunity to be problem solving thinkers. It gives them the chance to really trial and error, and think through not only problems in STEM, but problems throughout their lives, on the playground, and also through the other curriculum. 2:41Skip to 2 minutes and 41 secondsWhen businesses and other community partners see the potential that it has to provide another resource to both our kids, and more importantly to the teachers in the schools who are educated our kids, it sells itself. The Utah STEM Bus is going to be a great opportunity for our schools. 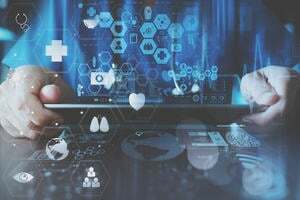 And the fact that industry sees the need for that, and they are willing to fund it, is a big step in the right direction for education in Utah. Ta-da! I find it hard to believe that a company that is invested in STEM would not find this as a great opportunity. And we need to put a stem. Oh yeah. A stem. Definitely a stem. Bradley Hunsaker discusses his role as STEM Bus Program Coordinator for the Utah STEM Action Center’s mobile makerspace, Utah STEM Bus. The Utah STEM Action Center created the Utah STEM Bus as a mobile classroom and makerspace. The mission of the bus is to introduce real-world, hands-on learning experiences to students, parents, and educators in schools and communities across Utah. The Utah STEM Bus started as a vision conceived by the Utah STEM Action Center and local industry partners that wanted a way to get students excited about STEM, and to show pathways into various STEM careers here in Utah. The Utah Transit Authority donated a 40-foot transit bus built in 1997 that we then retrofitted into a mobile classroom and makerspace. 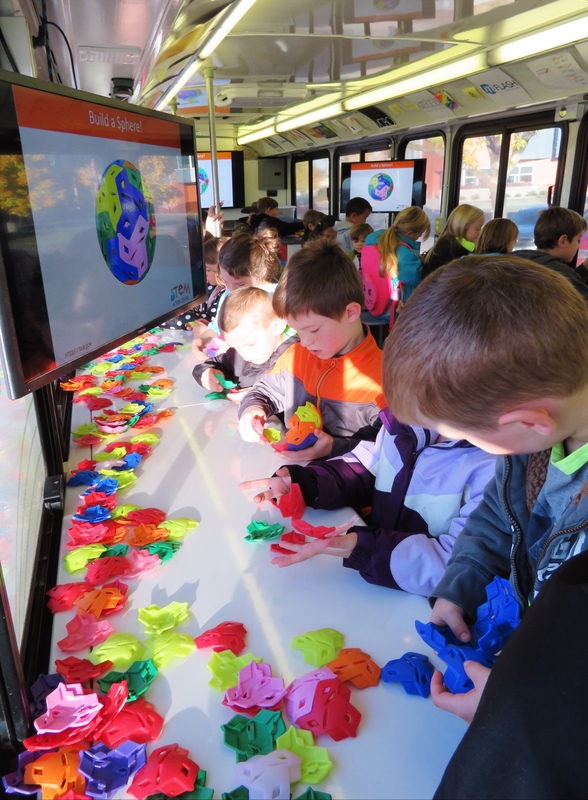 The Utah STEM Bus is outfitted with enough workspace to fit upwards of 30 students, and it houses three TVs, an A/V system that can link everything together, a 3D printer, and various other hands-on projects for people to engage with. The Utah STEM Bus is a very unique platform in that we can facilitate all of our learning activities inside the bus while we drive it all across the state of Utah. The Utah STEM Bus has been a great success so far. We officially launched our pilot program in December 2016, and ran it until the end of the school year in May 2017. 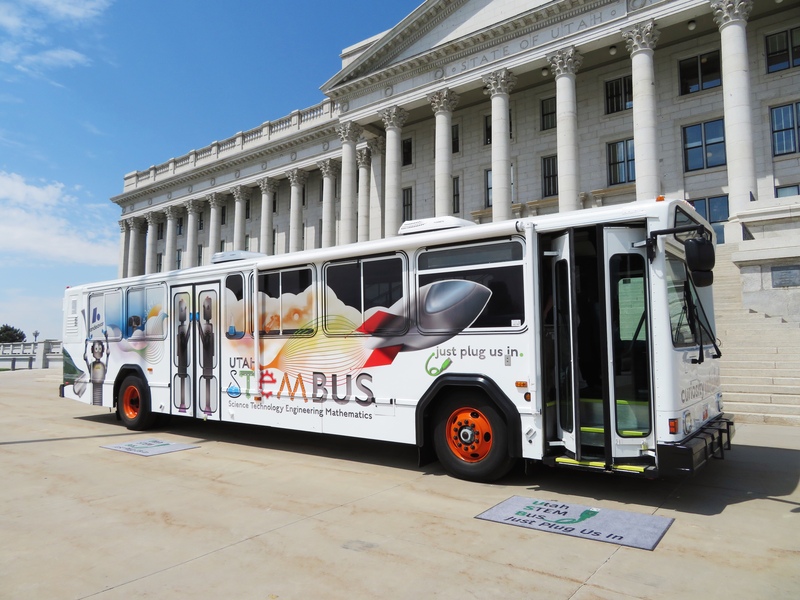 During the pilot program alone, the Utah STEM Bus reached 19 schools and 3281 students. Over the following summer we participated in several parades and events across Utah to promote public awareness of the bus. We went to the Schools for the Deaf and Blind for their summer camp, to the Ogden Youth Correctional Facility to teach a class of high school age inmates, and to numerous daycare centers to get younger kids excited about STEM. We have been going non-stop since the school year started in August, and as of the end of December 2017, we have reached 19 schools and 3870 students. Due to the high demand for the bus, we were able to expand our team from three to four members. Currently, we’re on track to reach 40 schools and 8000 students this school year; we also have an ongoing interest list of about 130 schools waiting to see if a spot will open up this year for a visit. We are also actively partnering with many local commercial organizations to create a new curriculum for the bus. Our biggest challenge so far has been trying to operate and maintain a 20-year old bus. As with any older vehicle, we have had to do a lot of upgrades and fixes to make sure the bus is not only roadworthy, but also safe for students as a classroom. The initial retrofit of the bus brought a lot of problems that we had to solve, creating innovate solutions to get everything working together. Another hurdle we faced was the creation of a curriculum which not only engages and challenges 4th graders, but can scale and provide rigor for 12th graders as well. Luckily, with the help of industry partners sponsoring our curriculum, we have been able to find ways to teach to all grades and still make activities challenging and engaging without having to purchase new equipment. We also split the curriculum into two categories: K-3 and 4-12. The K-3 programs are 30-minute lessons that help students understand what STEM is and that get them excited. The 4-12 programs are two-hour courses that really get the students engaged in hands-on activities and show them pathways into future educational opportunities and careers relating to the topic. Currently, the Utah STEM Bus is under a five-year grant through Andeavor (FKA Tesoro). This grant was given in the hope that, after those five years, we could become self-sufficient and find new funding sources for the Utah STEM Bus. With the Utah STEM Action Center being part of the Governor’s Office of Economic Development, we hope to begin pulling from State funding within the next few years. The retrofit of the bus as a makerspace was the biggest cost by far. Surprisingly, purchasing supplies and equipment for the bus wasn’t that big of a problem. The main goal of the Utah STEM Bus is to partner with local Utah companies to create a curriculum with ties to our state. That also means a lot of the equipment we use for the bus is either donated or discounted. What’s next for your makerspace? Our next big step is to become legislatively funded within the next few years. Once we have that ongoing funding secured for the program, we will look to the creation of a second bus to expand our capacity. We have a second donated Utah Transit Authority bus that is currently sitting unused. Once we have a vision behind what we want the second bus to be, and a main sponsor, we can begin the retrofit phase again. For the current bus, our hope is to continuously partner with new businesses in Utah, and to constantly update what curriculum we offer, so that the bus never gets boring or old. We will continue to add the newest innovations to the makerspace to maintain the wow factor of the bus. We will also continue to try and find easier ways for schools and other organizations to register for a Utah STEM Bus visit.